Objective The SCN11A gene encodes the NaV1.9 sodium channel found exclusively in peripheral nociceptive neurons. Methods All enrolled participants were evaluated clinically by electrophysiologic studies, DNA sequencing, and punch skin biopsies. Results All affected family members are afflicted by episodes of pain. Pain was predominantly nociceptive, but not neuropathic in nature, which led a diagnosis of fibromyalgia in some patients. All patients had normal findings in nerve conduction studies for detecting large nerve fiber neuropathies and skin biopsies for detecting small nerve fiber pathology. Conclusions Unlike those patients with missense mutations in SCN11A, small fiber sensory neuropathy, and neuropathic pain, the Arg225Cys SCN11A in the present study causes predominantly nociceptive pain with minimal features of neuropathic pain and undetectable pathophysiologic changes of peripheral neuropathy. This finding is consistent with dysfunction of nociceptive neurons. In addition, since nociceptive pain in patients has led to the diagnosis of fibromyalgia, this justifies a future search of mutations of SCN11A in patients with additional pain phenotypes such as fibromyalgia to expand the clinical spectrum beyond painful small fiber sensory neuropathy. Mutations in genes encoding voltage-gated sodium channels (Nav) have been instrumental to the understanding of mechanisms underlying pain. This has mainly involved 3 types of Nav—Nav1.7, Nav1.8, and Nav1.9. The key protein element, α-subunit, of these Nav is encoded by SCN9A, SCN10A, and SCN11A genes,1–3 respectively. Genotype and phenotype associations have not been clear in mutations of SCN11A. Three patients with L811P and L1302F missense mutations develop congenital insensitivity to pain.4,5 Other missense mutations (Ile381Thr, Lys419Asn, Ala582Thr, Ala681Asp, Ala842Pro, Leu1158Pro, and Phe1689Leu) were associated with painful sensory neuropathy.4 These 7 mutations were not verified through cosegregation analysis. Finally, 4 additional missense mutations (Arg225Cys, Ala808Gly, Arg222His, and Arg222Ser) were identified in 4 large Asian families and an Argentina family,6,–,8 each cosegregated with family members affected by episodic pain syndrome (EPS). However, EPS was not systematically characterized; in particular, it is unknown whether these patients have pathologic or electrophysiologic changes in peripheral nerves. In this study, we report a family with the Arg225Cys missense mutation in SCN11A that exhibits no clinical and pathophysiologic evidence of peripheral neuropathy, but nociceptive pain. This disassociation suggests dysfunctional nociceptive neurons by the mutation. The affected proband (0001) was initially evaluated at the Vanderbilt Rheumatology Clinic for fibromyalgia. She was then referred to the Vanderbilt Charcot-Marie-Tooth (CMT) clinic. The remaining 1 unaffected and 5 affected family members were enrolled and evaluated at the Clinical Research Center at Vanderbilt University Medical Center (figure 1A). This study was approved by the local institutional review board (IRB). A written consent form was obtained from all participants. (A) Family pedigree: filled shapes represent affected members, and unfilled shapes represent unaffected members. The arrow points to the proband. (B) Representative sanger sequencing traces were from an affected and an unaffected participant. The box outlies the mutated nucleotide. In addition to medical history and neurologic examination, the CMT neuropathy score10 was obtained from all patients. The score comprised sensory/motor symptoms and physical findings in limb sensation/muscle strength. The electrophysiologic portion of the score was omitted to produce the CMT Examination Score (CMTES) and will be described separately. The CMTES ranges from 0 to 28, with higher scores indicating an increase in disease severity. Nerve conduction study (NCS) data were acquired using conventional methods.11 For motor nerves, the distal stimulation distances for motor conduction studies were 7 cm in the arms and 9 cm in the legs. For the sensory nerves, the stimulation distance was 14 cm for median, ulnar, and sural nerves but 10 cm for the radial nerves. DNA from blood cells was extracted from all other family members using a commercial kit (#A1620; Promega, Madison, WI). DNA was then sequenced by Sanger sequencing for the Arg225Cys mutation. Primers were designed as 5′-TCGATTTCACCTTGGAGGTC-3′ and 5′-CAGTTAGCACAGTGCCTGGA-3′. PCR products were sequenced in GenHunter Corporation (Nashville, TN). This technique has been detailed before.13 In brief, punch skin biopsies (3 mm in diameter) were obtained from the distal leg and distal and proximal thigh of all participants. The tissues were fixed in fixatives (4% paraformaldehyde). The tissues were shipped to the coauthor's (L.Z.) laboratory for processing. Epidermal nerve fibers were stained with antibodies against PGP9.5 and counted under light microscopy. The experimenter who processed and counted the skin biopsies was blinded to the patient's ID and genotypic information. To characterize the nature of pain in the affected family members, we have identified 2 pain scales in the literature. The Rheumatoid Arthritis Pain Scale was developed to evaluate nociceptive pain in patients with rheumatoid arthritis.14 Because of the features and the responsiveness of pain to NSAIDs in our patients, this pain scale was considered to be suitable. We omitted those questions specific for arthritis or joint problems. The painDETECT scale was developed to evaluate neuropathic pain and was able to distinguish neuropathic pain from nociceptive pain in previously published studies.15,–,17 We reworded the questions to improve their clarity for patients. The questionnaire is detailed in supplementary materials (links.lww.com/NXG/A60). The pain scale was first tested in patients with amyotrophic lateral sclerosis (ALS) and diabetic polyneuropathy (DP). The study was conducted on consecutively identified patients with DP and ALS at the Vanderbilt Neurology Clinic over a 12-month period. Participants were excluded if they were younger than 18 years, if they had a coexisting medical condition that may cause significant pain such as severe cervical or lumbar spine disease, rheumatoid arthritis, or osteoarthritis, or if they answered “no” for the first question. We contacted patients by telephone to administer the scale prospectively after verbal consent was obtained. The scale was then applied to the affected family members with the mutation in SCN11A. The neuropathic and nociceptive subscores were compared using the Wilcoxon signed-rank test. It should be clarified that this study is not aimed at validating new pain scales, but at using the previously published scales to characterize the pain features quantitatively. This project was approved by the Vanderbilt University IRB. All patients consented to participation in this study. This is a 29-year-woman with a chief complaint of chronic pain. She came to the Vanderbilt Rheumatology clinic for evaluation of fibromyalgia. Pain is mainly concentrated in feet but only 1 place at a time. She describes it as “deep, aching” pain. It typically lasts from 15 to 30 minutes. It starts mildly and then peaks. Affected areas may be warm during these episodes but range of motion, strength, and sensation are intact and showed no erythema or swelling. Pain occurred daily during her childhood, but now twice per week. Pain is mostly at night and may wake her up from sleep but sometimes during the day. She rates pain at 6–7 of 10. It is often worsened with weather changes but could occur without obvious reason. Ibuprofen helps but cannot prevent the recurrence. After she was seen in the Vanderbilt CMT clinic, she discontinued ibuprofen for 12 months but took gabapentin that failed to control pain. Ibuprofen was restarted. Symptoms disappeared when she was pregnant but returned 2 months after childbirth. She denied a history of diabetes, renal disease, vitamin deficiency, or HIV infection. She is a practicing optometrist with no history of cognitive dysfunction. On neurologic examination, she was found to have normal cranial nerve functions. Her muscle strength was 5 on the Medical Research Council scale in all muscle groups. Sensation was intact to light touch, pinprick, and vibration. Deep tendon reflexes were normal. Her CMTES was 0. A complete laboratory evaluation for systemic rheumatologic disorders was performed. It revealed a mildly elevated erythrocyte sedimentation rate of 32 (range 0–20), otherwise normal for antinuclear antibodies and creatine kinase. The proband's aunt is a 53-year-old woman. She had a normal developmental history. Her symptoms started in early childhood. Pain occurred in her bilateral knees, ankles, and toes and was about 3–4 times per week. She describes pain as dull/aching type. It was made worse by exertion and weather changes and made better by taking nonsteroidal anti-inflammatory drugs (NSAIDs). It typically lasts 20–30 minutes. She denied numbness or tingling associated with her pain. Of interest, at the age of ∼20 years, her symptoms including pain resolved spontaneously. She denied fainting, sweating, or orthostasis associated with the pain episodes. Her neurologic examination was normal. The CMTES was 0 at her clinic visit. The remaining 4 affected members in table 1 showed symptoms similar to the 2 cases detailed above. Taken together, these 6 affected members demonstrated the following key phenotypic features: (1) pain is episodic and fits with nociceptive or inflammatory pain, but not neuropathic pain, in nature; (2) sites of pain are length dependent, and all 6 patients have pain mainly in feet and distal legs; (3) NSAIDs, but not gabapentin, are effective in all 6 patients, supporting inflammatory pain; and (4) all patients have no abnormal physical findings. We verified the Arg225Cys mutation using Sanger sequencing in our laboratory (figure 1B). Arg225Cys was found only in affected family members (0001, 0100, 0101, 0103, 1000, and 1001) but absent in a nonaffected family member (0102). The mutation was evaluated by 2 servers—PolyPhen-2 and Sorting Intolerant from Tolerant (SIFT).18 Both PolyPhen-2 and SIFT predicted that Arg225Cys is pathogenic. In addition, the Arg225Cys allele was absent in 107,784 chromosomes of control population in the ExAC database (exac.broadinstitute.org/). Missense mutations in Nav1.7, Nav1.8, and Nav1.9 have all been associated with painful sensory neuropathy with pure small nerve fibers affected or small fibers predominantly damaged.4 To further clarify this issue, we performed NCS in all our participants (table 2). There was no evidence of peripheral neuropathy in all studied participants. NCS mainly tests larger diameter nerve fibers but is insensitive to the changes in small diameter nerve fibers.19 We thus performed skin biopsies to quantify intraepidermal nerve fiber density. This test targets nonmyelinated sensory nerve fibers and is highly sensitive in diagnosing small fiber sensory neuropathy.13 All studied participants showed normal EDNF (table 3). Therefore, there is no evidence of small and larger fiber peripheral neuropathy in our patients with the Arg225Cys mutation. To systematically characterize pain in patients with the Arg225Cys mutation, we used previously published scales that were designed to detect nociceptive and neuropathic pain.14,15 ALS primarily affects motor nerves. It is mainly associated with nociceptive pain. By contrast, patients with diabetic neuropathy are well known to develop neuropathic pain.20 We therefore tested the scale to determine whether the scale can show the difference of neuropathic vs nociceptive pain in these 2 populations of patients. The distribution of demographics was similar between DP and ALS groups (table e-1 and figure e-1, links.lww.com/NXG/A60). Patients with DP showed significantly more neuropathic pain than nociceptive pain (p = 0.01). By contrast, participants with ALS showed more nociceptive pain (p = 0.02). We then administered the scale to patients with the Arg225Cys mutation (table 1). Patients with the Arg225Cys mutation showed almost exclusively nociceptive pain but no or minimal neuropathic pain (9.0 ± 7.2 nociceptive vs 0.3 ± 0.82 neuropathic; p = 0.015). Note that participant #1000 has not had pain since her 20s due to spontaneous remission. She was removed from the statistical comparison between neuropathic and nociceptive pain. Our study has identified a Caucasian family afflicted by a missense mutation of Arg225Cys in SCN11A that has not been described in North America except in Asian families.6 In considering the cosegregation of the mutation with affected family members in previously reported families6,–,8 plus the family reported in the present study, the Arg225Cys is clearly pathogenic. However, we found no pathophysiologic evidence of peripheral neuropathy in our patients. All affected patients exhibit features of nociceptive pain that is typically seen in patients with rheumatoid arthritis or other inflammatory joint diseases but does not fit with neuropathic pain. In addition, patients are all responsive to NSAIDs but not drugs against neuropathic pain. These observations support inflammatory stimuli that either evoked or exacerbated pain along with the dysfunctional nociceptive neurons by the mutation. Nociceptive pain in these patients was often described as an aching type pain, which is commonly associated with musculoskeletal or joint pain. During their pain episodes, symptoms were commonly described as originating unilaterally with point tenderness and would slowly, in a matter of minutes to hours, ascend proximally in the affected limb. In the lower extremity, pain was described as ascending to the mid-lateral thigh; however, 2 patients were affected as proximal as the hip. Of note, 1 patient (II-1) described their pain as having a burning and tingling sensation on their questionnaire, which was mild (1 on scale of 1–5). However, these were not the features in other patients. Otherwise, his pain description was largely nociceptive in features. Thus, if there were any neuropathic features of pain, it was minimal. Of interest, in our family, the most common exacerbating factors for pain was exertion/physical activity and weather changes, both of which have been associated with increased localized inflammation. In line with this issue, SCN11A knockout mice showed impairment of somatic inflammatory pain behavior21,22 Together, these observations also suggest that pain by the Arg225Cys mutation may involve participations of other cell types such as inflammatory cells. The exact pathogenic mechanisms between neurons, glia and inflammatory cells in relation to pain are unknown. Pain may arise from the distal part of peripheral nerves since pain shows a clear length-dependent pattern in all studied patients with the Arg225Cys mutation. Missense mutations in Nav have been associated with painful sensory neuropathies.1,4,23 This is well expected for Nav1.7 and Nav1.8, given the known biology of the 2 types of Nav. However, this association is not well explained in patients with mutations in Nav1.9 since Nav1.9 is exclusively expressed in nociceptive neurons. Indeed, our patients rarely presented with features of neuropathic pain. Some patients with the Arg225Cys mutation have even been diagnosed with fibromyalgia. Furthermore, both NCS and skin biopsies showed no evidence of peripheral neuropathy. Therefore, the EPS phenotype with nociceptive pain observed in the present study is well in line with the known biology of Nav1.9. Clinicians may add EPS into their differential diagnosis when dealing with cases presenting no peripheral neuropathy but nociceptive pain. This observation also redirects our attention to additional pain phenotypes that may relate to the genetic alterations in SCN11A. 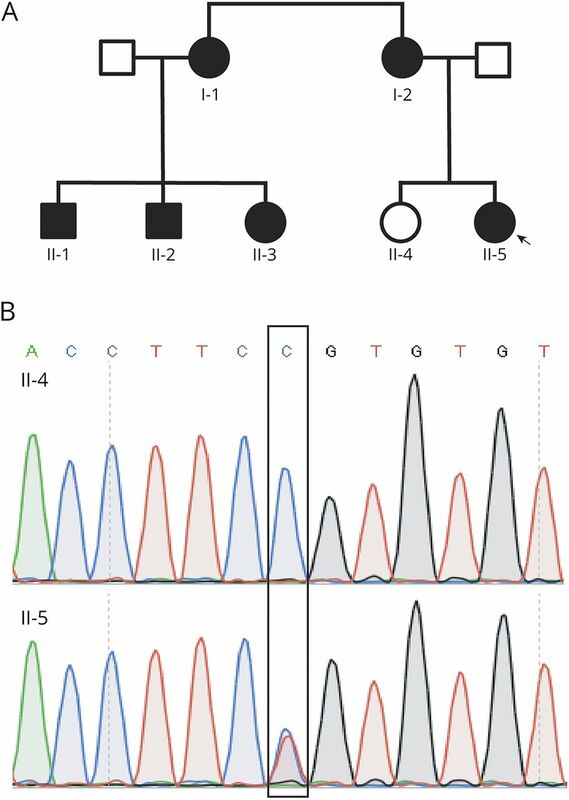 Here, we have described EPS in a Caucasian family with the Arg225Cys mutation in SCN11A. Detailed characterization of the family enables us to reveal pain likely arising from dysfunctional nociceptive neurons of peripheral nerves that lacks detectable pathologic alterations in large and small nerve fibers. This pain phenotype is also consistent with the hyperexcitability observed in dorsal root ganglion neurons expressing the mutant Nav1.9.6 This phenotype is clearly distinct from neuropathic pain observed in patients with painful small fiber sensory neuropathy and other missense mutations in Nav. R. Castoro: participated in conceptualization of the study, data acquisition, analyzed and interpreted data, and drafted the manuscript. M. Simmons, L. Zhou, V. Ravi, D. Huang, C. Lee, and J. Sergent: acquisition of data. J. Li: conceptualized the study, analyzed and interpreted data, drafted the manuscript, and supervised the study. This research is supported by grants from the NINDS (R01NS066927), the Muscular Dystrophy Association, and the National Center for Advancing Translational Sciences (UL1TR000445). R. Castoro, M. Simmons, V. Ravi, and D. Huang report no disclosures. C. Lee has served on the commercial advisory board of CSL Behring. J. Sergent has received research support from the NIH. L. Zhou reports no disclosures. J. Li has served on the scientific advisory boards of the Muscular Dystrophy Association and the Charcot-Marie-Tooth Association and serves on the editorial boards of the Journal of the Peripheral Nervous System, Experimental Neurology, Neurology: Neuroimmunology & Neuroinflammation, and Neural Regeneration Research. Full disclosure form information provided by the authors is available with the full text of this article at Neurology.org/NG. The Article Processing Charge was funded by NIH grant. Accepted in final form May 21, 2018.
. Gain-of-function mutation in Nav1.7 in familial erythromelalgia induces bursting of sensory neurons. Brain 2005;128:1847–1854.
. An SCN9A channelopathy causes congenital inability to experience pain. Nature 2006;444:894–898.
. Gain-of-function mutations in sodium channel Nav1.9 in painful neuropathy. Brain 2014;137:1627–1642.
. Cold-aggravated pain in humans caused by a hyperactive NaV1.9 channel mutant. Nat Commun 2015;6:10049.
. Infantile pain episodes associated with novel Nav1.9 mutations in familial episodic pain syndrome in Japanese families. PLoS One 2016;11:e0154827.
. Familial gain-of-function Nav1.9 mutation in a painful channelopathy. J Neurol Neurosurg Psychiatry 2017;88:233–240.
. Gain-of-function mutation p.Arg225Cys in SCN11A causes familial episodic pain and contributes to essential tremor. J Hum Genet 2017;62:641–646.
. Hereditary neuropathy with liability to pressure palsy: the electrophysiology fits the name. Neurology 2002;58:1769–1773.
. A novel missense mutation of CMT2P alters transcription machinery. Ann Neurol 2016;80:834–845.
. Intraepidermal nerve fiber density in rat foot pad: neuropathologic-neurophysiologic correlation. J Peripher Nerv Syst 2005;10:202–208.
. Development of an instrument to measure pain in rheumatoid arthritis: rheumatoid Arthritis Pain Scale (RAPS). Arthritis Rheum 2001;45:317–323.
. What is the evidence that neuropathic pain is present in chronic low back pain and soft tissue syndromes? An evidence-based structured review. Pain Med 2014;15:4–15.
. Use of the painDETECT tool in rheumatoid arthritis suggests neuropathic and sensitization components in pain reporting. J Pain Res 2014;7:579–588.
. A combined functional annotation score for non-synonymous variants. Hum Hered 2012;73:47–51.
. Search for long-lived particles decaying to jet pairs. Eur Phys J C Part Fields 2015;75:152.
. Chronic pain with neuropathic characteristics in diabetic patients: a French cross-sectional study. PLoS One 2013;8:e74195.
. Contribution of the tetrodotoxin-resistant voltage-gated sodium channel NaV1.9 to sensory transmission and nociceptive behavior. Proc Natl Acad Sci USA 2005;102:9382–9387.
. The voltage-gated sodium channel Na(v)1.9 is an effector of peripheral inflammatory pain hypersensitivity. J Neurosci 2006;26:12852–12860.
. Sodium channels in normal and pathological pain. Annu Rev Neurosci 2010;33:325–347.